Enterprises, hospitals, educational institutions, catering establishments storing disinfectants are strictly regulated. The rules described in Sanping. Their execution is controlled by the inspection authorities. The house we are our own masters, and reviewer. A main control on our health and the health of our family. And remember that chlorine, phenol, ammonia, formaldehyde active suppliers of carcinogens. What should be in the first aid kit? Almost all disinfectant household chemicals, from the "beloved" of chlorine, of which our grandmothers, nurses and cleaners abundantly covered or watered toilets and bathrooms up to modern means for cleaning tiles, tubs, and bathrooms, contain unsafe chlorine, ammonia, phenol and other substances. We know the basic rules, how to handle them (with gloves on, with the door open and turned on the exhaust). But we often forget about caution when storing these disinfectants. Remember that a good housewife is only stored for future use. And storage instructions and safety rules usually do not read. Except that, at the opening of the bags to clean sewers are careful, painfully aggressive powder you have to dissolve the water in the pipes. In General, powdered chemicals should be treated with extreme caution. Here we refer to normal washing powder, bleach powder products to control insects (flies, cockroaches, household ants). Means aerosol can be a source of toxic gases. 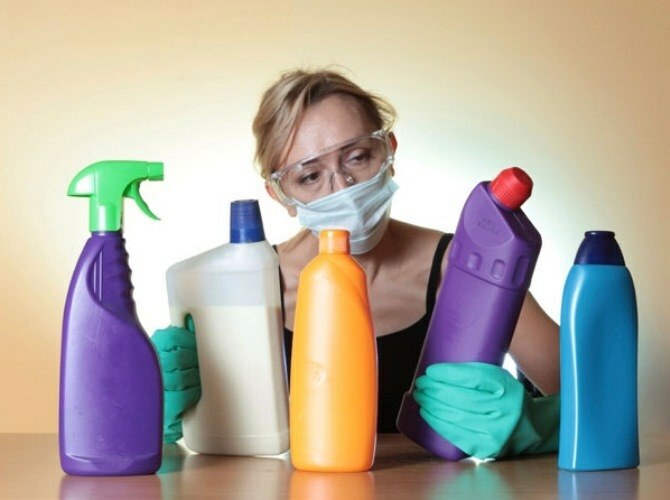 Improper storage of disinfectants and household chemicals can lead to chemical interactions and reactions of the products with the release of hazardous substances, toxins and gases. The consequences that await us due to incorrect storage and use of disinfectants and cleaning chemicals, can manifest as dermatitis, allergies and asthma, low immunity. The main rule – out of reach of children. If you live older people with signs of memory disorders – all need to hide under lock and key. Highlight the apartment has a separate storage room, area hallway or on the balcony if the climate allows. In their home is the closet space or private lockers and more. The kitchen is not suitable for storing chemicals. Scroll to the top of the shelves for the most dangerous substances. Below the shelf with the usual household cleaning products, then – washcloth, microfiber cloth, abrasive coatings, and other stuff. All containers of disinfectants, detergents and bleach should be sealed or Packed in durable plastic bags. All containers and bags of chemicals, especially disinfectants, must be signed. They should preserve their original packaging. If you vehicle has been poured into or poured into another container, attach to it the name and instructions for use. Today you remember a week later, unable to forget what is in the Bank. Never keep household chemicals and disinfectants under direct sunlight and near heating devices. This rule applies to flammable substances: adhesives, alcohol, thinner, acetone.